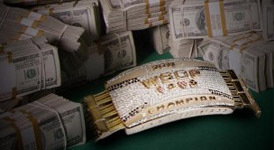 For the first time at the 2011 World Series of Poker, the Hard-Stop Rule came into play at a very strange time on Day 2 of a tournament, halting the $10k PLO Championship with just 38 players remaining and the money bubble set to burst at 36 players. So two very unlucky poker players will return to the Rio for a third day of action, and after three days of play will still be walking away empty-handed. The $10k PLO Championship could end up being another murderer’s row final table –similar to the 2-7 Championship earlier in the 2011 WSOP that may go down as the toughest final table of all time—considering the number of young superstars left in the field: Sami “LarsLuzak” Kelopuro, Will “The Thrilla” Failla, recent bracelet winner Sam Stein, Jared “harrington25” Bleznick, Matt Glantz, Mike “Timex” McDonald, and Josh “litlebastrd” Tieman. Along with the young guns that are still in the running so are some of the more seasoned live players like Humberto Brenes, Ludovic Lacay, Abe Mosseri, Alexander Kravchenko, Surinder Sunar, Max Pescatori, Joao Barbosa, Felipe Ramos, and John Kabbaj. This entry was posted on Sunday, June 26th, 2011 at 7:32 am and is filed under Poker News. You can follow any responses to this entry through the RSS 2.0 feed. You can leave a response, or trackback from your own site.